It’s an exciting time to be in the retail industry. As I wrapped up my summer internship at the Bamboo Rose marketing team, I reflected on what I’ve learned and what I’ve experienced. I always imagined the retail supply chain being modern and technologically advanced, but behind the slick customer facing front end, retail continues to rely on outdated tools and processes. What strikes me most is that many brands are missing out on the opportunity to rapidly deliver products to market. What’s ‘in’ changes not only by the season, but by the week, so retailers need to focus on creating relevant products — especially for younger consumers in my generation. Even though many of my peers do a large share of their shopping on Amazon, for anything from textbooks, to apparel, to groceries, traditional brick-and-mortar retail stores are here to stay. Millennials, including myself, take more than cost into account when we shop: The experience is just as important. Young consumers are drawn to stores with inviting, well designed interiors that complement the merchandise — think Urban Outfitters and Ikea. Online retailers can compete on price, but traditional retail can create a shopping experience Amazon can’t. Technology in retail is not only poised to speed the product development timeline, bringing merchandise from designers to consumers faster than ever before, but also promote the better business practices that millennial consumers care about. Increased collaboration up and down the supply chain can ensure that retailers choose suppliers who create a safe environment and pay workers a living wage. Companies like Everlane have pioneered this approach and made manufacturing practices more transparent for consumers. Similarly, retailers equipped with advanced technology can work with suppliers to meet millennial consumers’ environmental concerns and source sustainable materials. This summer has taught me that retailers have a tough task ahead of them: How do you successfully market to a growing segment of consumers for whom price is no longer the most important factor? The solution lies in making the retail supply chain more nimble, collaborative and sustainable. It means being in touch with the latest trends and styles and creating an image around your brand. When younger consumers buy a product, price is often considered to be just as or even less important than the brand name, the quality and the ‘story’ behind the product. Millennials are more likely to think of where an item was made, how the materials were sourced, and how the final product made it to shelves. I’ve learned that retailers have a lot of catching up to do if they want to compete today’s retail economy, and a key step brands can take towards creating a lean, responsive and sustainable supply chain is by adopting the latest technology. 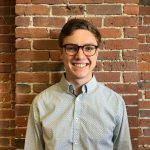 Jack is a marketing intern for Bamboo Rose and a rising senior at Tufts University. He studies economics and international relations and is interested in marketing analytics and international business. In his free time, he enjoys travelling, skiing in New Hampshire and spending time at the beach in Maine.